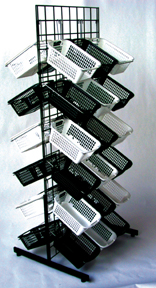 This White Double Sided display rack holds 36 durable plastic baskets that easily detach to allow for quick refills and restocking. With this white metal display stand you can rotate your products on and off the floor to keep your inventory looking fresh and anew. 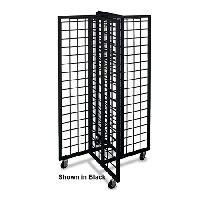 The wheeled grid wall fixture can be quickly moved, giving your products maximum visibility. Customers tend to buy more objects when they are easily obtainable and close together. Cross merchandise materials by simply including any garment accessories like jewelry, scarves, belts, ties and more in the other baskets. Some assembling of this product is required but easy to put together. 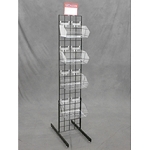 Get ready to kick your sales into high gear with this grid wall stand. Purchase your freestanding floor fixture today.